The general consensus on the New Orleans SSCA conference seemed to be that New Orleans was just too big a draw, and attendance at conference programs suffered. That was the case the the SCoR panel. 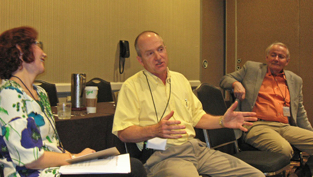 SCoR panels have historically attracted packed rooms at SSCA, but this year, we had just a handful of participants. What we lacked in numbers, we made up for in quality. Our small group enjoyed a lively discussion on the topic of “identification” as exemplified in two speeches by Louisiana governor Bobby Jindal, his gubernatorial victory speech from 2007, and his Gridiron Dinner speech from March, 2013. The two speeches are interesting inasmuch as one comes from relatively early in his political career, his first major political victory in Louisiana, while the second is from very recently after Jindal had established himself as a national political figure and a possible presidential contender. In his 2007 victory speech, Jindal, born of Indian immigrant parents, a convert to Catholicism, seems to presume identification with his Louisiana constituency, while in the Gridiron speech, he highlights his difference from the stereotypical American. Participants in the seminar were invited to explore the ways in which Jindal negotiates identification, especially in these two speeches. Brief position statements from Stephanie Houston Grey (Louisiana State), Andy King (Louisiana State), J. Clarke Roundtree (Alabama, Huntsville), and Marilyn Young (Florida State) opened the conversation and provided some direction for the conversation. James Darsey (Georgia State) and Stephanie Houston Grey organized this year’s meeting of SCoR at SSCA.